Back in January when the North Carolina General Assembly reconvened under Republican control for the first time since Reconstruction, FHQ wondered aloud if Republican Senator Andrew Brock (R-34th, Davie, Rowan) would introduce for the fourth consecutive legislative cycle a bill to create a separate presidential primary election; a primary that could then be shifted up to an earlier date on the presidential primary calendar. On Monday that wait ended. Brock and Senator Brent Jackson (R-10th, Autryville) introduced S440 which would establish a separate presidential primary and schedule it on the first Tuesday in March. North Carolina has typically held its presidential primary concurrently with its primaries for state and local offices in early May in the post-reform era. 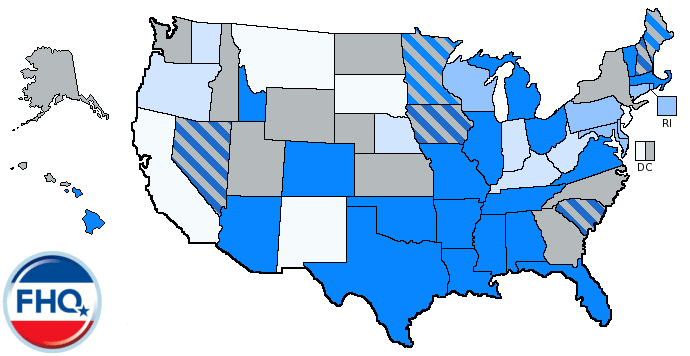 The Tar Heel state has, however, held early (March) primaries before. Before both 1976 and 1988 the legislature moved the presidential primary into March. 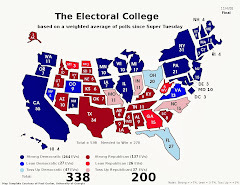 It proved consequential on the Republican side in the former (propping up Ronald Reagan's at-that-point flagging campaign) but was lost in the shuffle of the host of other southern states holding simultaneous contests in the latter. It is unclear what effect this proposed move would have should it be passed and signed into law. It is a fairly safe bet that the Old North state voters would more than likely have a say in determining the Republican nominee in March next year -- that the nomination will have yet to have been determined by that point. Yet, if the nomination remains unclear deep into the calendar, North Carolina could once again, like 2008, be well-positioned to influence a nomination race at a juncture in the calendar with a relative lack of contests. Now, that said, there are a few other notes to make about this situation. S440 is just the fourth bill to be introduced nationwide to propose moving a delegate selection event forward in 2012 (see Colorado, New Mexico and Texas). North Carolina, though, is the only state thus far to propose creating an all new presidential primary election. 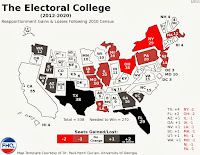 Colorado previously had the separate caucuses and both New Mexico and Texas would (or would have) moved not only the presidential primary, but the primaries for state and local offices to earlier dates as well. The bill Sen. Brock has introduced, then, flies in the face of much of the primary movement legislation during the 2011 state legislative sessions. Not only does it propose moving forward, but it also would require the added expenditure of taxpayer money to fund the new, separate presidential primary. Sadly, there is no fiscal note included with the other information on S440; nor is there a price tag on the past versions of this series of bills Brock has brought forward. And if that expenditure doesn't face obstacles among Democrats and Republicans alike in both houses of the General Assembly, it very well could face a veto from Governor Beverly Perdue. North Carolina, like most states, is facing a budget shortfall that may not allow for an additional line of appropriations for fiscal 2012 for a new election. Shunting the financial aspect of this to the side for a moment, there are also political implications for this as well. Sure, there's the fact that a Republican-controlled legislature would want its voters to have a say in a contested nomination race, but outside of that, this move, if the bill is enacted, could affect the reelection chances of members of the General Assembly and the governor. The governor isn't likely to see a primary challenge, but for members of the legislature, that may not be the case. 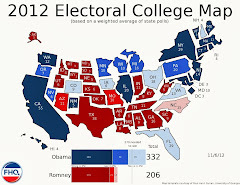 They may face challenges and may do so in a much lower turnout environment. Voters being asked to come back to the polls two months after having cast a ballot for presidential preference are much less likely to turnout to vote. Atkeson and Maestas (2008) have shown a significant drop off in the number of voters from an earlier presidential primary to a later primary for state and local offices. And that does have implications for those running for state legislative nominations. All of this will be on the table as the state Senate considers this legislation. Thanks to reader Thunder Pig for passing this news along.